Contains spoilers for Seasons One and Two. NCIS stands for Naval Criminal Investigative Services. This means that they investigate crimes connected to or involving Naval or Marine Corps personnel. More than one person refers to them as ‘Navy Cops’. Honourably discharged with the rank of Gunnery Sergeant from the United States Marines, Gibbs is now the senior Special Agent within NCIS. During his time in the Marines, he saw active duty at least once, and was a Military Policeman. From a comment he made in the Season Two episode Call of Silence, it seems appears it was his choice that he never became an officer. His actual age is unknown, but given his career history he is most likely in the region of 50/51. He has been with NCIS for nineteen years, implying that the Marines called him back to active duty on at least one occasion. He is an only child, his father is dead and he has no uncles. He has been married and divorced three times, and all divorces were far from amicable. All of his wives had red hair, and at least two of them physically attacked him. Number two hit him with a seven-iron, number three with a baseball bat. It is possible that he came home from a tour of duty and found wife number one in bed with another man. He pays alimony to all three wives, lost his house to one of them, number two emptied his bank account before leaving, and number three gets drunk on their anniversary and constantly harasses him by phone. He is a hard taskmaster who drives himself as hard, if not harder than he drives his agents. He expects and gets total loyalty from his team, whilst at the same time he displays a fierce loyalty to those he deems worthy of his caring. On the one hand he seems intolerant of anyone who doesn’t share his view of the world, on the other hand he cares deeply about what he perceives to be injustices. He does what he has to in order to get the job done, no matter what the cost, and is not averse to breaking the rules to suit himself. Yet he’s also prepared to cover up things that might cost people their careers, if it is not pertinent to his enquiry. An example of this is in the Season Two episode Lieutenant Jane Doe, when a Naval enlisted man, being questioned by Gibbs in relation to a double murder, reveals that he is involved in a homosexual relationship with a highly ranked Naval Officer. He is considered the best interrogator and investigator in the business, and he seems to be gifted with infallible intuition; as a result, he can break just about anyone. His style adapts to suit the person whom he is interrogating, and it can swing from almost not overly intelligent, warm, friendly, one-of-the-guys, to ice cold, deadly, steel. He’s extremely skilful with firearms, both at close range and at a distance. He can use and read American Sign Language and is proficient in Russian. He seems to have few friends, close or otherwise. The main exception to this is Dr. Donald 'Ducky' Mallard. He tends to be reticent and is reluctant to reveal his feelings. Yet he can be very charming in an understated way, and has a somewhat evil sense of humour. He spends most his off-duty time, not that there is a great deal of that, building a boat in his basement. He is somewhat of a luddite when it comes to popular culture, and anything technical - his attitude to something not working is to hit it on the desk. He is rarely seen without a cup of strong, black coffee in his hands, and woe betide anyone who gets between him and it. Off-duty he drinks high-proofed bourbon, referred to once by Tobias Fornell (of the FBI), whom Gibbs also considers a friend, as ‘paint stripper’. Dr. Mallard, affectionately known as ‘Ducky’ to his friends and colleagues, is NCIS’s Medical Examiner. He is British, was educated at Eton, one of England’s top public (fee paying) schools, where he played cricket and ran short distances. He trained as a Doctor at Edinburgh University, and his work seems to have taken him around the world. Again, we do not know his exact age, but it is likely that he is about 62/63. He appears to be an only child, whose father is deceased. His 96 year-old mother, who is suffering from some kind of senility, lives with him along with her four Corgis. There is no evidence that he has ever been married or even involved in any long-term relationship. He is an expert in his own field, and if one believes his ramblings, an expert in just about every other field too. He is also highly respected within his field and knows a vast number, if not all of the other Medical Examiners and Coroners around the country. He knows Latin and Greek, and one gets the impression his knowledge is not just from his medical studies. The chances are that the classics would have featured during his education at Eton. He also speaks French, German and Swahili. He’s extremely intelligent and is clearly respected and liked by his colleagues, even if they are bemused and irritated by him on occasions. He is the only person, other than Gibbs’s superiors, who can truly influence Gibbs in any way. He is eccentric, he talks to the corpses as though they were still alive, explaining when asked, that dead or not, they are still human. He also tells, as every opportunity, long rambling stories about his experiences. He has also stitched Gibbs up after violent attacks from at least one of his ex-wives. On the one hand very mild mannered and easy going, he nonetheless has a temper when it comes to people interfering with a crime scene. Indeed as Gibbs tells us, he once pushed a French Policeman off a cliff, albeit into a lake (some 60” below). He also speaks very sharply to a psychiatrist whose patient had just been found dead in her room, the belief at the time being that she had committed suicide. He cares passionately about his colleagues and also about justice, and he too is prepared to bend, even break the rules, to assist in achieving the latter. Despite his bonding and caring, and knowing all his fellow professionals, he too seems to have few close friends; Gibbs being the exception. The relationship between Gibbs and Ducky, even putting aside any romantic involvement, is clearly one of old, extremely close, friends. Their friendship goes back many years, quite possible to when Gibbs was in the Marines. The story that Gibbs tells about Ducky pushing the French Policeman off a cliff, occurs in the Season One episode, Seadog, and is being told from first hand experience. Gibbs was there, as is shown when he makes reference to the fact that he hadn’t heard Ducky so annoyed since the incident. Gibbs knows what dogs Ducky’s mother has, knows about Ducky’s neighbours who keep him awake, and seems to have heard most of Ducky’s stories before. Another example of their friendship being a long-standing one is when in the Season Two episode, The Meat Puzzle, Agent Kate Todd asks Gibbs what Ducky looked like when he was younger. ‘Illya Kuryakin’, responds Gibbs, implying that he has indeed known Ducky for many, many years. Despite Ducky saying that Gibbs is ‘a man of more questions than answers’, he clearly knows more about Gibbs than anyone else. It is quite possible that he knew all three of Gibbs’s ex-wives; he certainly knew number three to whom he introduced Gibbs. He recognises the signs when Gibbs is particularly stressed or intent, knowing that six cups of coffee before lunch is not a good sign. He also knows when Gibbs is trying to protect his agents, rather than not trusting them, and gives advice as to how they can help their boss. Ducky can say things to Gibbs, even gently criticise him, that no one - not even Abby Sciuto, NCIS’s Forensic Specialist, who gets away with a lot - else can say. 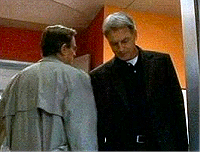 In the Season Two episode, SWAK, he stands up to him, most determinedly, when Gibbs wishes to leave Autopsy and thus break quarantine so that he can get on with trying to find who sent white powder in an envelope to NCIS. Although Gibbs clearly knows that he cannot leave and that Ducky is correct to stand in his way - literally - I got the impression that had it been anyone other than Ducky, Gibbs would have left. Agents McGee, Todd, DiNozzo and Ducky’s assistant, Jimmy Palmer are all present whilst their respective bosses argue the issue, and from their faces it is clear that they are firstly stunned that someone would stand up to Gibbs, and secondly sure that Gibbs will win. However, it is Gibbs who backs down at that time. The two of them have a seamless working relationship, often using shorthand terms and asking and answering unfinished questions that seem to leave even Gibbs’s longest serving agent (DiNozzo) baffled. They also, on more than one occasion, work a suspect, playing a faultless two-handed act, which is clearly non-rehearsed, but also obviously something they have done before. Whilst clearly close friends, the relationship between Gibbs and Ducky goes far deeper than merely friendship. The chemistry between them is clear; they like and respect one another, care for one another and love one another. They look at one another quite differently from the way they look at anyone else. Ducky’s eyes always become much softer when looking at Gibbs and do tend to give his feelings away. His smile, a fairly common occurrence, again is softer and more intimate when he turns it on Gibbs. He is the only member of the team to address Gibbs by his given name. Gibbs, who can often appear harsh, also softens when around Ducky; his smile becomes genuine and touches his eyes, which also soften. He nearly always uses a more intimate version of Ducky’s name, reducing it to ‘Duck’, and puts many different inflections into the single word. They two men also have a very tactile relationship. 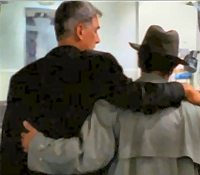 On more than one occasion Gibbs hugs Ducky; indeed there are two times when the two of them have their arms around one another. On another occasion Gibbs pats Ducky’s face. On another he tilts his hat back so that he can make eye contact with Ducky. Gibbs also puts his hand on Ducky’s shoulder several times, and there are many other general touches, brushes against one another, etc. Gibbs is a man who demands information in the exact way he wants it, at the exact time he wants it and it should be concise and the point. Indeed, when his agents fail to conform to his expectations, his displeasure is easy to see. However, he allows Ducky to ramble on for what, by Gibbs’s standards, is an age, with his stories until he says, in his fondly exasperated ‘Ducky’ tone, ‘Duck’. There are several examples of Jimmy Palmer, seemingly trying to imitate Ducky and maybe even impress Gibbs, launching into his own rambling, long-winded explanation of something pertinent to the dead body. When he does this Ducky tends to look slightly apprehensive and more than a little taken aback and glances from Palmer to Gibbs, and Gibbs looks more and more frustrated and irritated. On one occasion Ducky actually tells Palmer than ‘the right to digress is something that has to be earned’. On other occasions it is he who interrupts Palmer; however if he doesn’t do this quickly enough, Gibbs tends to snap, and it is not in his fondly exasperated way. Ducky also gets away with things that no one else would ever dare to try. He clearly manipulates Gibbs, and Gibbs just as clearly lets him. On one occasion, in the episode Season Two episode, Lieutenant Jane Doe, Ducky holds back information that might be pertinent to a case. When this becomes clear, Gibbs’s, although reverting to Dr. Mallard (and in turn Ducky calls him Agent Gibbs), is far more hurt and perplexed than angry. The confrontation takes place in front of Gibbs’s three agents, and it is clear from their reaction that they are expecting their boss to explode and be extremely angry - as he would be with them. 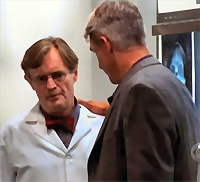 Shortly afterwards Gibbs follows Ducky down to Autopsy and Ducky explains his reasons for withholding the information, and asks Jethro to forgive him, a walking hug then follows. In this episode, Gibbs is even more intense, demanding, unforgiving and determined than he normally is. In fact it is fair to say that he is probably more so than he really needs to be. The reason for his intensity is simply down to the fact that Ducky is upset and suffering, and that clearly bothers and upsets Gibbs. So everyone suffers until the case is solved and Ducky can finally find some peace. There are two times during the series thus far when Ducky’s life is potentially in danger and Gibbs is clearly worried and upset. The first time is in Season One in the episode, Bête Noire, and also involves Ducky’s then assistant, Gerald, and Kate Todd. The second time is in the Season Two episode, The Meat Puzzle, and only involves Ducky. During the first example, whilst Gibbs is clearly concerned for all three of his team members, a somewhat stilted and very un-Gibbs-Ducky conversation via the telephone, reveals that Gibbs’s concern for Ducky is more than just that of a team member. His voice gives his feelings away, quite clearly. The second time Ducky is kidnapped and the chances of him being found alive are very slim. Gibbs, again to the clear shock of his agents, blames himself, insisting that he should have put two agents to protect Ducky and his mother. A frantic search begins and when they track down a potential suspect, Gibbs threatens that if his friend is harmed in any way that he will pull out all of the man’s teeth - there is no doubt in my mind that Gibbs is being completely serious. No one does quietly deadly as well as Jethro Gibbs does. 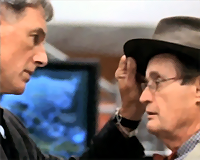 Gibbs does lead his team in at the eleventh hour, and Ducky’s life is saved. Gibbs then embraces Ducky and strokes his hair in full view of his three agents and the murderers; indeed it is Ducky who pulls his friend back to reality by saying in a somewhat false-testy ‘what kept you’? Or, 'It’s okay for me to criticise and tease my lover, but no one else can do so'. Other canonical evidence that points to Gibbs and Ducky being more than just good friends, is the way that is okay for Gibbs to criticise, tease or be irritated with Ducky, but woe betide anyone else who does this. Example one comes from the Season One episode Left For Dead. 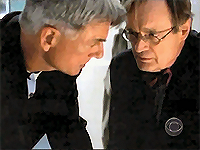 Ducky is complaining that there isn’t a body for him to work on, and Gibbs tells him to go and find one, adding that there have been many times when there has been more than one dead body. Ducky obligingly wanders off into the woods, leaving Gibbs and DiNozzo to work the crime scene. DiNozzo says ‘well done, boss’, and when Gibbs invites DiNozzo to elucidate, DiNozzo does so, saying that it was good thinking on Gibbs’s part to get rid of Ducky so that his ramblings didn’t interfere. Gibbs treats DiNozzo to a cold, steely, unblinking stare, daring DiNozzo to say something else - sensibly he doesn’t. Example two comes from the Season One episode <i>A Weak Link</i>. Here Gibbs and DiNozzo have gone down to Autopsy to see the body of the Marine whose D-link broke when he was abseiling down a cliff. DiNozzo takes the initiative and asks Ducky if he’s sent the tox screens up to Abby - a question that Gibbs regularly asks Ducky. Ducky looks slightly askance and put out, Gibbs on the other hand looks furious, and once again treats his young agent to his frozen, steely, ‘if looks could kill’ stare. DiNozzo this time, keeps pushing the issue saying ‘that’s what you were going to ask, boss? Isn’t it?’ Each time, Gibbs looks gets harsher. It is perfectly all right for him to ask such a question and thus imply that Ducky doesn’t know his job, but not for anyone else to do so. Example three comes from the Season Two episode An Eye For An Eye, and this time it is Ducky’s then assistant Jimmy Palmer, who crosses the line. He, probably in an effort this time to ‘protect’ Ducky from Special Agent Gibbs’s wrath, interrupts one of Ducky’s ramblings about transvestites, to explain that he thinks Special Agent Gibbs was asking Ducky about the specific dead body, not about his mental state. Again the double stare from Ducky and Gibbs silences him. Ducky is put out and bemused; Gibbs is annoyed. They always seem to be aware of where the other one is at any time, even if they aren’t looking at one another. 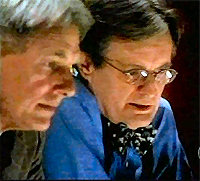 An example of this comes from the Season Two episode Hometown Hero, where Ducky is once again telling one of his lengthy stories, which began with him talking to Gibbs. 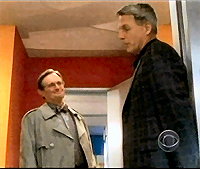 After a very short time, Gibbs leaves and Jimmy Palmer keeps trying to interrupt Ducky to tell him that Gibbs had left. Finally Ducky breaks off to ask his assistant what he wants, and Palmer explains that Gibbs left. Ducky’s response is that he knows that, and in fact, Gibbs left a while ago, so why was Palmer only mentioning it now. Their comfort level around one another is immense. They are clearly at ease with one another and even when there is no deliberate touching, they have little or no regard for one another’s personal space. They are open with one another in a way that neither man is with their other colleagues or associates, and they clearly have a deep respect for one another. Ducky is also the only person whom Gibbs never treats as a somewhat errant schoolchild. The only time that Gibbs seems to respect Ducky’s personal space is on the occasions when he’s more than usually irritated with his ME - this is the exact opposite to the way Gibbs is with everyone else. Gibbs is a fairly tall man, about six foot, and as such does, on more than one occasion, deliberately use his height to intimidate, even with his team. However, he never does this with Ducky, who is about six inches shorter than Gibbs, choosing instead to back off slightly when particularly annoyed, rather than move closer and risk any hint of intimidation. The chemistry between them, both as friends and more, is intense. Indeed Ducky is the only person with whom Gibbs has anything resembling a normal relationship, and Ducky, who is friendly with just about everyone (on the side of good), is a different man with Gibbs. As mentioned, Gibbs is not an openly emotional man; he mainly shows irritation or frustration or his own somewhat quirky sense of humour. It is only Ducky, however, who is able to tease any of the softer emotions out of his friend, something he does on more than one occasion. Their deep caring for one is another is clear in everything they do, say, in the looks they exchange, their ease around one another, their understanding of one another, the mutual trust and respect they share, and their honesty with one another. 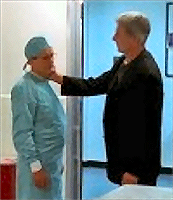 An example of the utter trust that Gibbs has for Ducky comes in the very first episode of Season One, Yankee White, when there appears to be an hour’s discrepancy between the time of death of a Naval Officer called by the President’s Physician and Ducky’s placement of the time of death. When told this, without even pausing, hesitating or questioning further, Gibbs nods to Ducky and says, ‘Ill take yours’. Their relationship is easy-going, and on at least one occasion they resort to gentle teasing and jokes. During the Season One episode, My Other Left Foot, when the team are called to investigate the discovery of a leg that has a Marine style tattoo, Ducky, after passing comment on the leg, declares that he saw an antique shop around the corner and would be there. He adds that Gibbs should call if he needs him. 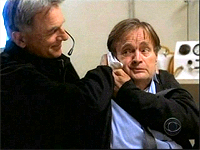 Gibbs lets Ducky get a few steps away then calls, with a smile on his face, ‘Ducky, I need you here’, thus bringing Ducky back to his side in order to engage him in a humorous bantering exchange, which he could easily have done before Ducky walked off. It ends with Gibbs adding ‘I’ll shout if I need you’. Both men clearly enjoyed the very un-Gibbs-like repartee. In the Season One episode, The Curse, when the mummified remains of a corpse are found in a Naval pod, Gibbs glances at Ducky and asks, ‘Estimated time of death, Duck?’ In his turn Ducky says, the gentle humour and deep affection clear in this voice, ‘Very amusing, Jethro.’ This gets him one of Gibbs’s smiles, the ones he reserves solely for Ducky. They are not the all so often young, dashing, pretty, ‘hot’ couple that so often forms a fandom partnership (for me as well as others). Instead, they are a mature, handsome, close couple whose bond goes back decades, rather than just years, and whose love (be is simply fraternal or fraternal and romantic) for one another is blatantly clear for anyone to see. Ducky in particular either makes no attempt at hiding his feelings for Gibbs, or isn’t aware of just how much his eyes, his voice, and his general behaviour around his old friend, reveals. Gibbs, although less overtly obvious, does also, by virtue of the way he softens, is far more indulgent and generally relaxes (albeit ‘relax’ when used in relation to Jethro Gibbs is a somewhat loose term) make it clear that he has strong feelings for Ducky. Even in the middle of examinations or Autopsy reports when they are together, they seem to slip into a world that excludes everyone else. Gibbs’s agents and Ducky’s assistant might be present, but they aren’t part of the Gibbs/Ducky world and exchanges. They are quite professional and focussed on the case, when Ducky isn’t telling one of his rambling stories, but the world around them has contracted to contain just them. This couple should be followed because of the depth of affection, caring, love and trust they have for one another. They don’t in-fight, argue, or spend their time playing one-upmanship games, nor do they compete with one another. Neither has anything to prove to the other, they’ve known one another for too long for that, been too close to need to resort to games or backstabbing or bitching. They complement one another, fit into one another’s worlds and lives, and are secure enough in their own feelings not to be afraid to show how much they care for one another. You were leaning on me. And who makes better lovers than friends. My foray into NCIS started simply because of David McCallum. I am a fan of his and thus wished to see the series. I had no intention, at that time, of adding another fandom to the three I was already involved in, nor of looking for another pair to slash. Not that I ever look for slash in a show; it either hits me or it doesn’t. If I have to look for it, then for me it doesn’t exist at any serious level. However, more than one friend asked me ‘if you had to slash a couple who would it be’? 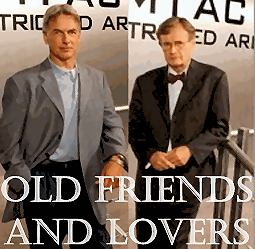 And my reply, right from the first episode, was Gibbs/Ducky, as their connection was everything that I looked for in a slash pairing, and was the only pairing I could see as being even remotely possible. I continued, thanks to a dear American friend, to watch all of the episodes of Season One and several of Season Two, but I was still just watching the show for interest and enjoyment. Indeed at that time it was quite a relief not to watch with my ‘slash hat’ on, as I could relax and enjoy the show and not look for connections, etc. etc. in a way that isn’t possible, for me, once I begin to slash a pairing. I then began to rewatch Season One, and suddenly I realised that I was watching the Gibbs/Ducky interactions and connections with my slash hat on. The touches, hugs, looks, tone of voice, past knowledge of one another, their comfort level with one another, all took on another meaning and before I really realised it, I had them as a couple. Even then, though I wasn’t prepared for how far they’d take me over, and just how intense my involvement with them would be. My first forays into writing them arose from a discussion on a Man From U.N.C.L.E. list, where a couple of people were saying that they didn’t want to read stories where Ducky was actually Illya, because they only wanted Illya to be with Napoleon - a sentiment with which I agreed. Then I recalled the ‘Illya Kuryakin’ exchange from the Season Two episode, The Meat Puzzle. This led me to a little MFU/NCIS crossover idea, and from there my love affair with this couple was well and truly born. They appear to be so right for one another, their connection is intense and clear, and they fulfil everything that I personally look for in a slash pairing. They are not actual working partners, together virtually every minute of their on-duty time, day in and day out, but their relationship is every bit intense as if they were - more so in fact. This pairing started off being very rare within NCIS fandom and although interest in them has grown considerably, there still aren't a great many resources to them alone. My stories for this couple can be found on the NCIS Gibbs/Ducky Fiction part of this site. NCIS Fanfiction Archive and MTAC consists of stories for all pairings and genres. Other Gibbs/Ducky fiction can be found in the memories section of the Gibbs/Ducky Live Journal Community.